In Storyboard Pro, there are a series of preferences that are available to customize behaviour and help you set up an efficient workflow. The preferences related to script and panels editing are principally grouped under the General tab, in the General and Scenes sections. By default, new storyboard projects are created without sequences. Select this option so that new projects are automatically created with a sequence—see SequencesSee Sequences. The Naming tab contains preferences related to the naming convention and behaviour of scenes, sequences, and panels. By default, newly added scenes are named without a leading zero: 1, 2, 3, 4, 5, etc... You can change the default behaviour so that new scenes have leading zeros in their name: 01, 02, 03, 04, 05, etc... When this preference is enabled, the Minimum Number Characters option becomes available. NOTE: Enabling this preference will not add leading zeros to already existing scenes in your project. By default this preference is disabled. 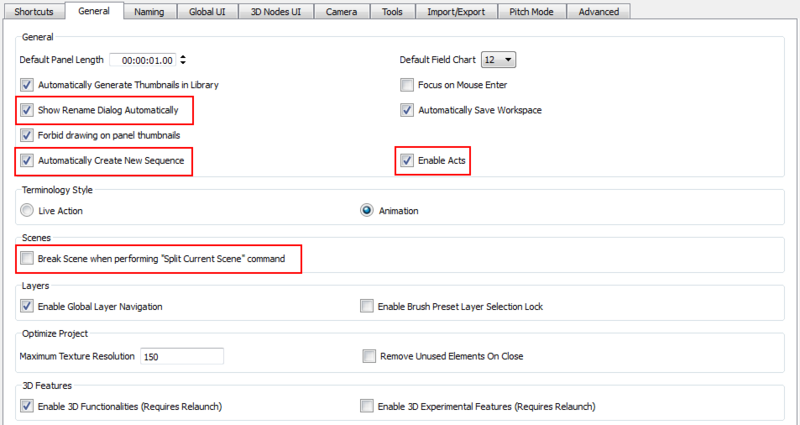 You must enable the Automatically Add Leading Zeros option before in the Scene Name section, because they work in tandem. This field determines the minimum number of characters the scene names will contain, using leading zeros. When adding a new scene, the increment is 1. Select this option to choose your own increment number. When copying a scene, the copy retains the same numbering as the original, but with an added suffix. For example, a copy of scene 10 would be named 10_A. Note that if the scene is copied in a different sequence, it will be named 10. When you select this option, the copy of the scene is named using the next available scene number, following the established increment rule. For example, the copy of scene 10, could be called scene 11. Use this preference to set up the suffix pattern to use when a suffix is added to a new scene when the name is already in use. Newly added sequences are named without a leading zero: 1, 2, 3, 4, 5, and so on. Select this option so that new sequences have leading zeros in their name: 01, 02, 03, 04, 05, and so on. When this preference is enabled, the Minimum Number Characters option become available. By default this preference is disabled. You must enable the Automatically Add Leading Zeros option in the Sequence Name section, because they work in tandem. This field determines the minimum number of characters the scene names will contain, using leading zeros. • For example, the default value is “2”: 01, 02, 03, 04, 05, 06, 07, 08, 09, 10, and so on. • If you type “4”: 0001, 0002, 0003, 0004, 0005, 0006, 0007, 0008, 0009, 0010, and so on. By default, the increment when adding a new sequence is 1, you can change this behaviour by enabling this preference and choosing the desired increment number from the Increment Name by field. By default, when copying a sequence, the copy will retain the same numbering as the original but with an added suffix. For example, the copy of sequence 2 would be named 2_A. You can change this behaviour by enabling the Increment Naming on Copy preference. Doing so, the copy of the sequence will be name using the next available sequence number, following the established increment rule. For example, the copy of sequence 2, could be called sequence 3. Use this preference to set up the suffix pattern to use when a suffix is added to a new sequence when the name is already in use. By default, panel names are named numerically. Using this preference, you can select from three other alphabetical increment rules. The difference between each of them is the behaviour once you reach panel Z. The total number of panels is displayed with the panel name. You will find some more preferences related to panels and script on the Import/Export tab of the Preferences dialog box. This preference refers to the behaviour when using Storyboard > Import Images as Scenes function. If the element you are set to create upon import does not already exist in your project, you are prompted to create the element. 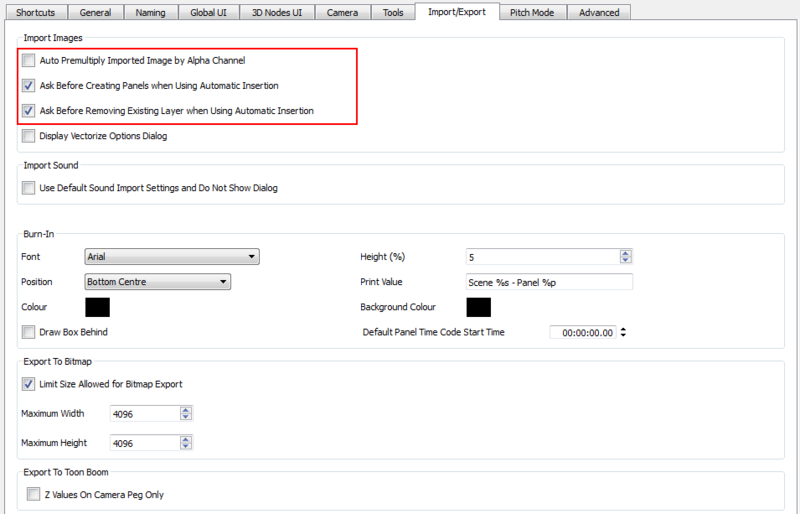 This preference refers to the behaviour when using Storyboard > Import Images as Scenes function. If the element you are set to create upon import does already exist in your project, you are prompted to remove the original element or keep it.